You can buy cucumbers year-round to add to salads. The vegetable is primarily water, with a mild flavor and crunchy texture. Cucumbers purchased in the supermarket usually come with a wax coating that helps prevent bruising, so you often peel them before eating. The peel can also be bitter and unpleasantly tough. Peeled cucumbers are not the most nutritious vegetable, but they do count toward your daily vegetable intake. One cup of chopped, raw cucumber without the peel contains 16 calories. Cucumbers contain no fat. The 3 g of carbohydrates in a cup of peeled cucumber is composed of 1 g of fiber and 2 g of naturally occurring sugar. You get 1 g of protein in a cup of cucumber, but it is incomplete – meaning that it does not provide all of the amino acids your body needs like better sources of protein, such as meat, fish or soy, do. One cup of chopped, peeled cucumber contains 96 international units of vitamin A, less than 10 percent of the daily value based on a 2,000-calorie diet. You also get 4.3 mg of vitamin C in 1 cup of the vegetable – adults need between 75 and 90 mg daily. It contains 9.6 mcg of the 90 to 120 mcg of vitamin K you need daily. Peeled cucumbers are a minor source of folate and other B vitamins. Peeled cucumbers are a medium-potassium food with 181 mg per cup of chopped and peeled vegetable. Potassium helps keep your mineral and fluid balance in check, regulating blood pressure, heartbeat and the gastrointestinal tract. 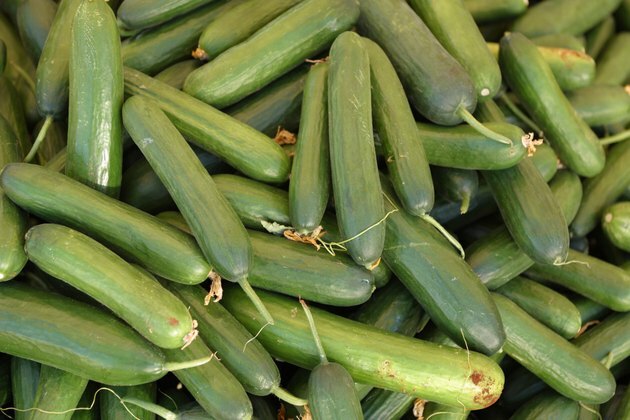 Peeled cucumbers also contain small amounts of magnesium, copper and manganese. Calcium, iron and phosphorus are also present in peeled cucumbers, but not in nutritionally significant amounts. Although they are a staple in garden-style salads, you can use cucumbers in other ways. Cucumber coins make a low-calorie alternative to chips or crackers when paired with dips. You can put cucumbers on sandwiches for moisture and crunch. Chopped cucumbers make a crisp addition to fresh salsa. Blend peeled cucumber into a summertime gazpacho. Many diet plans include cucumbers because they are low in calories and carbohydrates. While adding cucumbers to your diet is a good start in terms of vegetable consumption, strive to eat additional vegetables with higher nutritional value, such as leafy greens and orange squash. What Is the Nutritional Value of a Cucumber?